In 1914, Frenchman Louis de Corlieu made the first public demonstrations of his fins or “propulseurs de nage” as he called them. 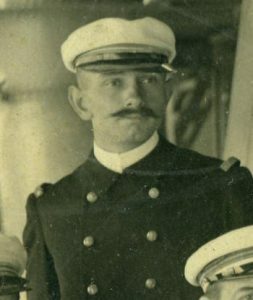 Being capitaine de corvette (Lieutenant Commander) in the French Navy, he wanted to display the effectiveness of his invention to his colleagues that included Yves Le Prieur. De Corlieu swan during 6 hours covering 8 km in 12°C water in Saint-Jean-de-Luz bay, southern France. Many people attribute the invention of the fins to Louis de Corlieu but many other design and patents are filed before like the flexible ones of Dunlop. We could say he his the one who made the fins spread with the story of Owen Churchill.